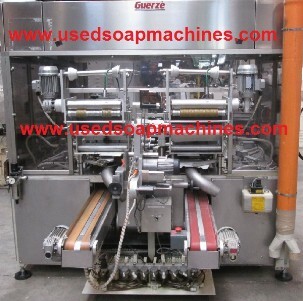 STRETCH FILM SOAP WRAPPER "GUERZE CE-75"
The GUERZE CE-75 Bar Soap Stretch Wrapper is designed to wrap with stretch film all banded, bandless and specialty shaped soaps. 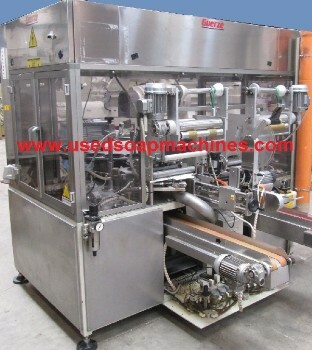 The Operator feeds the stamped soaps into an indexing rotary motion soap infeed table, two soaps at a time. In order to achieve the speed two wrapping heads are placed at the side of the indexing table and use the stretch film fed from 2 reels, one for each head. 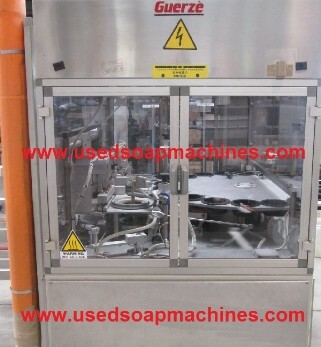 A square shaped film of 300 x 300 mm is cut from the reel and it is moved with cam operated mechanism under the soap. The soaps and the wrapping film are lowered into the wrapping head. During the transfer the film is pre-stretched. The wrapping head, with the soap inside, stretches the film around the top of the soap by using an iris. A hot knife seal and cut the excess film. Two fingers hold, transfer and discharge the excess film in the tube connected with blower. fed self-adhesive labels, on top of each soaps. The wrapped, sealed and labeled soaps are discharged onto two independent driven discharge conveyors, one for each head. The CE-75 is a mechanical unit with cam operated mechanisms. The indexing rotary soap infeed table has removable pockets according to the shape of the soap. This feature allows for quick and easy changeover from one size to another, in about 10 minutes. Prewired electrical controls and operator panel according to I.E.C. standards.